This guide describes the college’s procedures for curriculum modification. Each department or program is responsible for continually reviewing and refining the curriculum and courses it offers and for initiating proposals for new curricula and courses. The college recognizes active participation in this process as part of the professional responsibility of every faculty member. The deadline for submission of all minor curriculum changes to be implemented in Spring 2019 is Monday, August 27, 2018. The deadline for submission of all major curriculum changes to be implemented in Fall 2019 is Friday, September 28, 2018. Minor curriculum modification proposals to be implemented in Fall 2019 may be submitted anytime before Friday, October 26, 2018. Departments proposing new degree programs intended to begin in Spring 2020 are encouraged to submit their proposals no later than Monday, January 28, 2019. Proposers must have completed all four steps of the Guidelines for Preparing a New Academic Program Proposal. Proposals for other major curriculum changes to be implemented in Spring 2020 are due no later than Friday, February 22, 2019. The deadline for submission of Experimental Courses is generally one semester before course will run. Proposals must be proofread and vetted before submission. All necessary approvals for each proposal must be obtained before the proposal is submitted. The completed proposal package must be submitted to Phillip Anzalone, Curriculum Committee Chair. 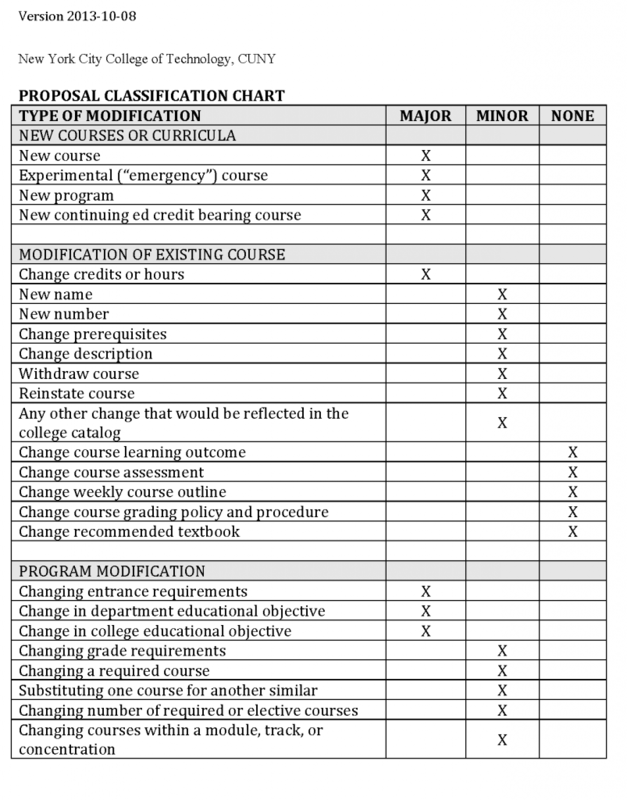 Use the new Proposal Classification Chart to determine which type of curriculum modification (if any) your proposal requires.